This issue’s article is by James Glover who attended the recent Conference in Bangalore on Vedic Mathematics and Astronomy. James has been teaching and researching Vedic Maths since 1980 and is the author of five books on the subject. This course starts in a few days – on 26th January 2014. It is a 9-week course, with 36 lessons, and is fully online. It is a great pleasure to announce that the Vedic Mathematics Teacher’s Manual (already available in 3 languages) is now available in Hindi. Since this is the main language of India, from where the reconstruction of Vedic Mathematics originates, it is particularly gratifying that this book will now be available for free in India and elsewhere. “The Psychology of Vedic Mathematics” by James Glover discusses the question as to what is the nature of the Vedic sutras of Sri Bharati Krishna Tirthaji’s system such that they could cover all of mathematics. This new Vedic Mathematics Research Group is for anybody interested in following or contributing to the development and research of Vedic Mathematics. The aim is to act as a conduit for like-minded people to share their insights, questions and discussions concerning the VM sutras and their applications. The group will also keep you informed with any ongoing VM events such as workshops, talks or seminars. is now in two sections. The first for teachers who have been certified by the VM Academy, and the second is other tutors. This year the National Institute of Vedic Science hosted a conference at the Maharani Ladies College in Bangalore from 20th - 22nd December. The conference was on the subject of Vedic Mathematics and Astronomy. The conference brought together prominent academic scholars in the field and 40 papers were presented. The guest speaker at the inaugural session was the governor of Kanartika, HR Bhardwaj. 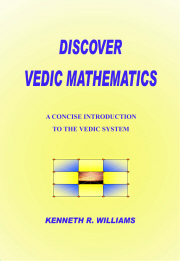 Vedic mathematics has two sides, the study of classical texts, particularly from the mathematics school in Kerala, and the more modern Vedic mathematics of Sri Shankaracarya Bharati Krishna Tirtha. Both are, in fact, linked because Bharati Krishna Tirtha studied the Kerala maths before coming up with his version of Vedic Mathematics. With regard to the Kerala mathematics important research has been conducted by scholars, such as Dr Vanishri Bhat who presented a examples of mathematical proof contained in commentaries on Bhaskara’s Lilavati, and Venketeswara Pai on the circumference of a circle. There were also a number of papers presented by a group of lady scholars from the KSR Institute of Chennai all concerning fascinating aspects of the Kerala school and its highly sophisticated treatment of the subject. In respect of the Vedic mathematics of BKT there were presentations of some ground-breaking research and development from scholars such as Mr Unkalka, Dr D.Babajee and James Glover. These presentations, amongst others, showed how the Vedic system can be extended into dealing with modern topics of mathematics and also set the ground for a new paradigm in mathematics in which the sutras of BKT cover the whole of mathematics because they express universal thought patterns. The conference provided scholars with very useful networking opportunities so that further research can grow and develop.